If You Owe Money To The IRS, You Have More Options Than You Think. 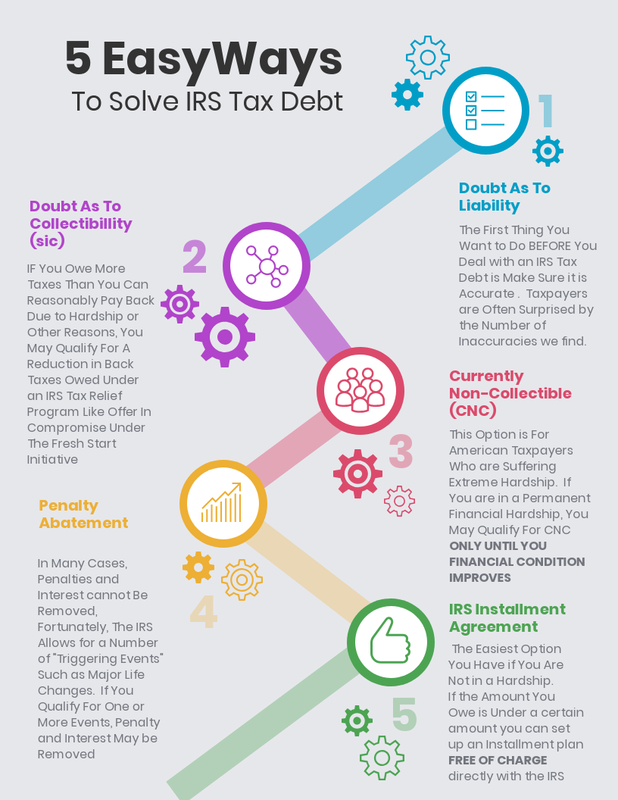 Take A Look At Below For An In-Depth Look At How You Can Solve Your IRS Tax Debt Today Without Expensive Tax Attorney Fees! If You Disagree With The IRS Assessment and Believe The IRS Tax Debt Owed Should Be Less, You May Qualify For A Full Or Partial Reduction in Back Taxes Owed. In Rare Cases, You May Even Be Due A Refund If You’ve Been Paying On An Inaccurately Assessed Tax Liability. If You Are Experiencing A Financial Hardship and Believe The Amount Of Back Taxes Owed Is More Than You Can Afford, You May Qualify For Doubt As To Collectibillity. To Qualify, You Must Meet A Number Of Criteria Such as Assets, Income And Expenses. If You Owe Under A Certain Amount, The IRS is Required To Offer A Payment Agreement. This Is The Best Option For Anybody Looking To Fix Their Taxes On Their Own. Every Taxpayer Is Unique and No Two Situations are Identical. Tell Us Your Story. Ask For Advice.